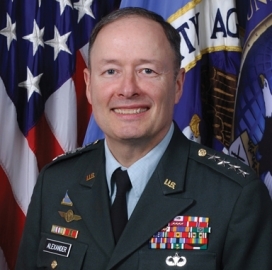 Army Gen. Keith Alexander, director of the National Security Agency for eight years, plans to step down from his position in March or April of 2014, Reuters reported Wednesday. NSA Deputy Director John Inglis will retire at the end of this year after serving as the agency’s second-ranking official for seven years, according to a report by Warren Strobel and Mark Hosenball. An agency spokesperson told Reuters Alexander planned to leave NSA in the spring after having his tenure extended three times. Alexander also serves as head of the U.S. Cyber Command, which works to develop offensive and defensive strategies for cyberspace. Officials reportedly have identified Navy Vice Adm. Michael Rogers, commander of the U.S. Fleet Cyber Command and U.S. 10th Fleet, as a potential candidate to succeed Alexander as NSA chief.